Imagine what the climbing world must be like if your name is Daniel Woods. You’ve climbed pretty much every hard boulder in the U.S. and a pretty healthy number around the world as well. You’ve dabbled with climbing on a rope in the past and had some notable successes, but you’ve never really dedicated a ton of time to such endeavors. It would seem logical then that if your name was Daniel Woods you would bring your forces to bear on some routes, right? Besides, what are routes other than a series of boulder problems separated (hopefully) by a few rests? Well, if this post and recent action in Clear Creek Canyon are any indication: Daniel Woods is ready to climb some routes. Recently, I have been switching things up and sport climbing. I have bouldered for so many years, and just needed something different. My friend and old coach Jim Redo showed me an open project in Clear Creek Canyon, CO. 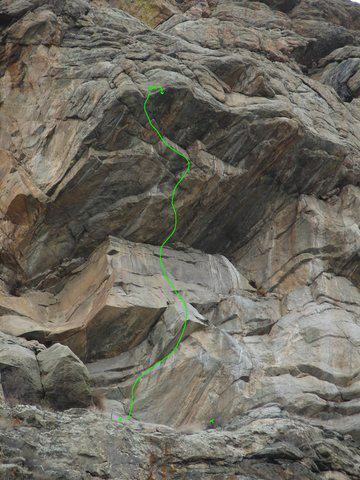 The line was bolted and freed as an aid route by Darren Mabe. The first pitch is a 5 bolt 12b leading to a no hands ledge at the base of the roof. At this point you are 250 above the river completely exposed. You are able to look out at the 6 draws dangling from the 50 degree overhanging ceiling, compose your nerves, and set off on the first boulder problem. This problem is 7 moves long using poor incut crimps for your right hand and textured slopers with your left. The finishing move of the problem consists of taking a right hand upside down gaston and jumping left hand to a sideways jug. Once you arrive here, you gather yourself and execute the 2 move v7 crux. At the end of this crux you have a full pad incut rail in which you can rest a bit before tackling the 4 move v9/10 crux at the end. The last move of this problem involves a dyno to the lip of the roof. Here sits a jug hueco in which you can clip the anchor. I was able to make the FA on my fourth try over 2 days. The climbing really suited my style. This roof is the hardest sport climb I have established and has given me so much motivation to bolt new lines. The new route is called Mourning Glory, and while it’s not mentioned explicitly in the Facebook update, that initial 7 move boulder problem is apparently V13 leading Woods to offer a suggest grade of 5.14c/d for the route. It will be interesting to see if this route becomes the cool thing to do for Boulder-area climbers like certain boulder problems have in the past. It will also be interesting to see how long Woods sticks to the route game. If he does stick with it, I don’t think it’s too big a reach to expect some big things from him. Having trouble envisioning an upside down gaston. Is that like an overhead hold that would be an undercling on vert terrain? They should just call it a Witness the Fitness hold. So in the sport climbing world an FA rated at 5.14c/d isn’t a “big thing” anymore? Come on I know that people are pushing .15’s now but very FEW people do that. A hard .14 by any measure is an amazing accomplishment in my eyes. Nice job Daniel! Very motivating! !